Outside of plush, the most popular crochet items I have found at cons are hats. While they’re not as common as the fleece ones, they are starting to gain popularity due to the versatility the working in yarn offers. One of the best examples of this is the viking/beard hat that made rounds online about 2 years ago. While crafty sewers can easily make a fleece version of the helmet, they will have to work much harder to create the ‘natural’ look that yarn provides for long beards. 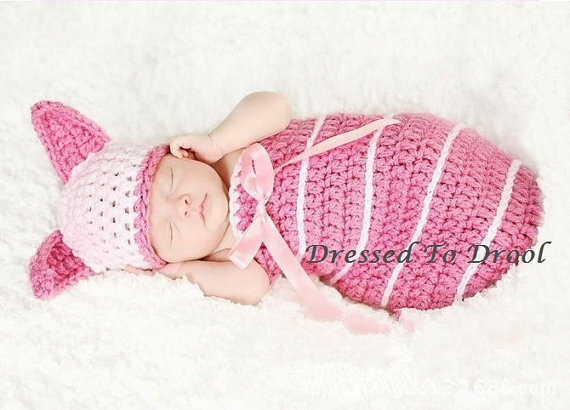 The application is also easier for a crocheter as they simply crochet the base under ‘beard’, and then use the scarf tassel method to attach the hair in large chunks. 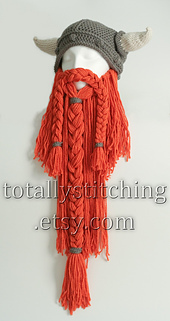 Which can then be braided and styled to the crafter’s liking. This is a bit on the more complex side though, so let’s scale things back. When starting out on your first hat, I highly recommend making a beanie first, especially if you have interest in making amigurumi/plush in the future. Most beanies are worked in the round but are fairly large, allowing you to get some experience with this method of crocheting before working with smaller hooks that making plush usually requires. When making beanies you’re also not limited to the average weight yarn as well. One of my favorite hats was made using left over homespun yarn that was large/chunky and just wonderfully soft and warm. I wouldn’t recommend think yarns for the hats if this is your first experience with them, however, as depending on the dye style/texture it can get quite difficult to see your individual stitches. Not all brands have this issue of course, and you should definitely shop around in person to see what your potential yarn looks and feels like. The issue I come across most often when teaching people how to make hats in the round is losing count/failure to increase evenly. While the former issue isn’t so bad as you can always stop working and count how many stitches you’ve done; the later can be quite a problem if you’ve gone several rows before you notice and have to pull out all your hard work. Stitch markers are your friend here, and while you may feel silly marking every increase the first few times, it will drastically help your accuracy and allow you to develop a rhythm and tension to your work. If you are hosting a party this Sunday then here are some great easy decorations you can create to make your party a success. First, I saw this great idea on the Rachel Ray show. It is an easy way to have “individual” dip bowls for your guests so they don’t have to worry about double dipping. It’s your party has a great idea for a Super Bowl table cloth. Spaceships and Laser Beams has 29 ideas for Super Bowl party decorations. Last but not least, 36th Avenue has everything you need for your Super Bowl Party. So celebrate this Sunday in style and show off your crafty side! Have you ever wanted to own your very own monster? Monster Pet Emporium allows your dream to become a reality. They create cute, cuddly, and creepy monsters as hats, scarves, hair accessories, or just as a pet. Who wouldn’t want their own monster? I fell in love with these cuddly monsters! There is something that is creepy but cute as the same time. If you would like to see more of these amazing monsters and adopt one of your own then check out their Facebook or their website. One of the things on my to-do list for 2015 involves leather-working, so I’ve been doing a little research. While my plans involve nothing as stunning or complicated as what this artist does, I can’t help but share her incredible work. Absolute Devotion is a small business in Perth, Australia by Rebecca Hedges. Her catch phrase is “wearable artistry” and man, does her work live up to that. 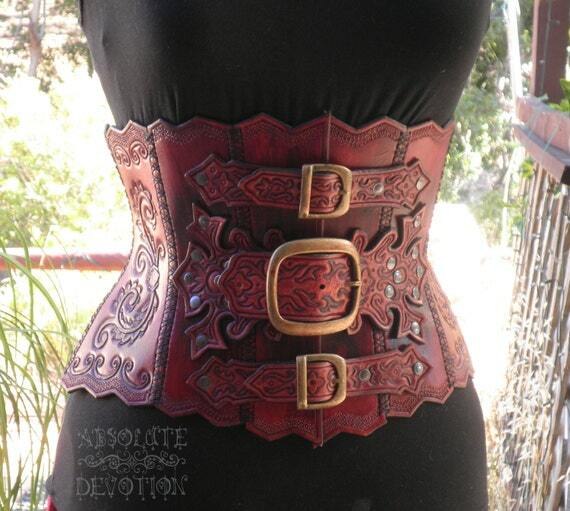 This corset is what first drew me to their page, but the more I looked, the more I felt in awe. 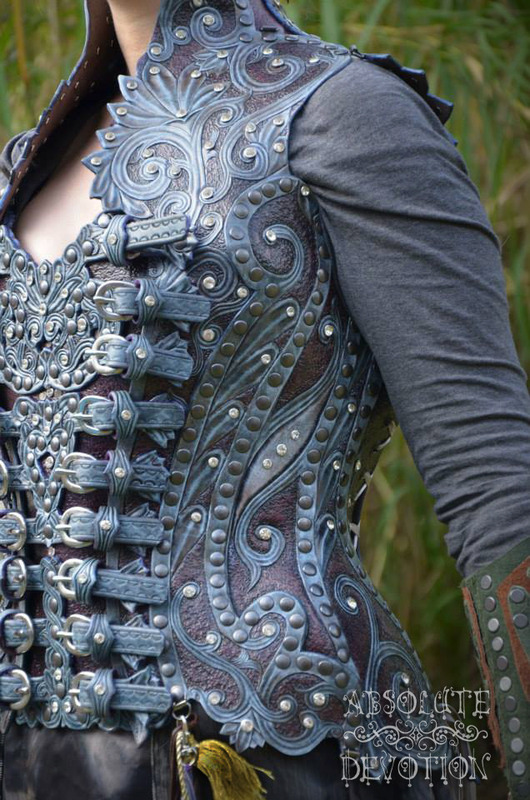 Not only does Rebecca have a beautiful sense of what she can create with leather, but her design skills are amazing. The intricacy, complexity, and detail involved in her works truly make what comes out a work of art. 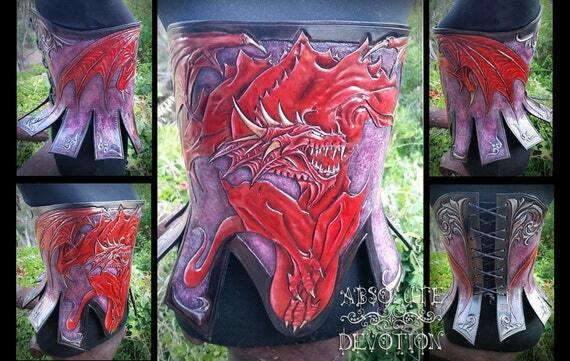 Even if you’re not interested in buying one, Absolute Devotion is great to follow as Rebecca will post regular updates and progress shots on Absolute Devotion’s Facebook page, allowing you to watch the creation of such stunning pieces as this dragon corset below. I’ve learned so much, just by watching already. With the time and effort that goes in to making something like this, it isn’t a surprise that her one of a kind pieces would fetch a pretty price, but you will undoubtedly be gaining a piece that will make the rest of your wardrobe feel pale and drab. For those of us not ready for the plunge into leather, Rebecca offers non-leather items too, which still have the flair and design beauty seen in her leather work. 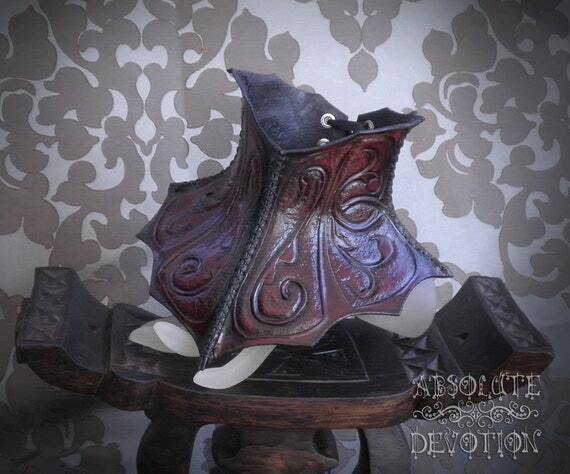 Absolute Devotion can be found on Etsy, Facebook, Tumblr, and Pinterest. Having attended cons for almost two decades now -yeah, I started young- I like to play a little game with myself when I travel the marketplace/dealer hall. Just a little observation bingo to see what variety there is (or isn’t) to be found. You can see trends in shopping preferences of the general public over the years if you make good mental notes, and it can even help you find new talent among the many aisles of tables. 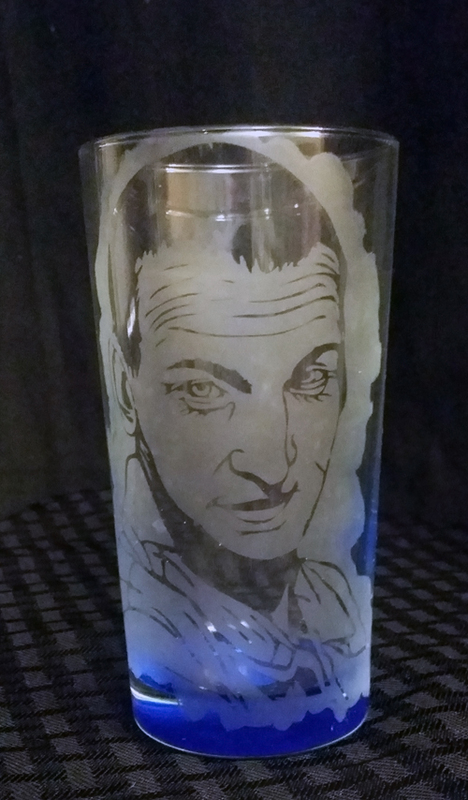 Glass etching is one craft that I’ve been slowly noticing an increasing appearance of, and while it wasn’t at a con, I’m happy to say my dash sent me a nice surprise recently. 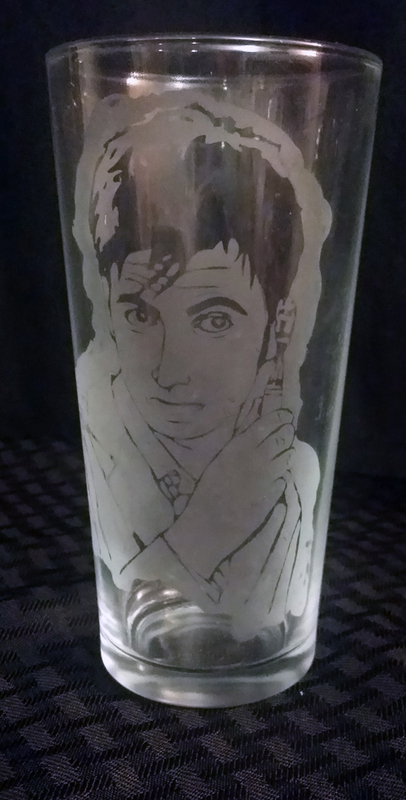 While I love classic logos and sprites on my glasses, I will admit that Lily Inverse Designs presented me with a new outlook on the possibilities for etched glass. While they do make a lot of typical con fare (buttons, pearlers, etc.) I can’t say I’ve ever seen someone do full portraits on glasses before. They’re only just started to experiment with this design aesthetic, but the possibilities it opens are very far reaching and I can’t wait to see what other character’s they will create. Perhaps you could send them some of your own suggestions? 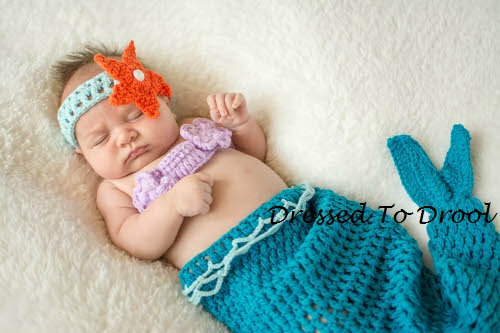 Mermaid? 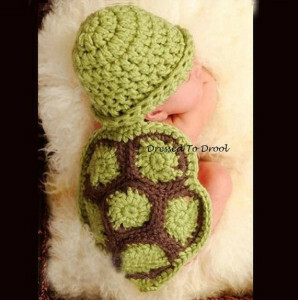 Turtle? Piglet? What’s your favourite?! There are so many more too! Make sure you stop by this amazing shop for your little new someone! 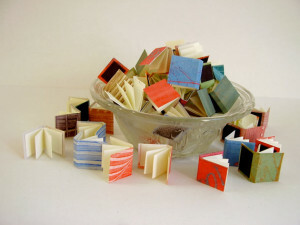 Sprouts Press Designs is a local Toronto business specializing in crafting hand-bound books using needle, thread and a variety of binding stitches. Carolyn, the creator of Sprouts Press, designs and creates all the products that Sprouts Press Designs carries. I don’t quite know where I first became familiar with Sprouts Press, whether it was through the store Freedom Clothing Collective, or at the One of a Kind show or somewhere else. At some point these beautiful creations were all around me! At this point, I want to share with you some of the gorgeous products that Carolyn creates! 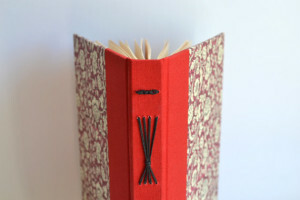 First, we have this Red Florentine Album Book. The Italian paper used in this book makes it special and beautiful! Sprouts Press also creates Watercolour Sketchbooks! These books hold 140lb watercolour paper that is perfect for any artist. Have you ever wanted to create your own hand-bound book? Sprouts Press gives you that chance with their bookbinding kits! 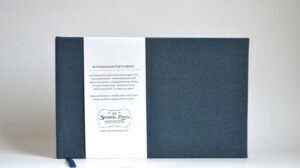 This kit in particular allows you to make 2 soft bound books and 1 mini book all in one very inexpensive kit! 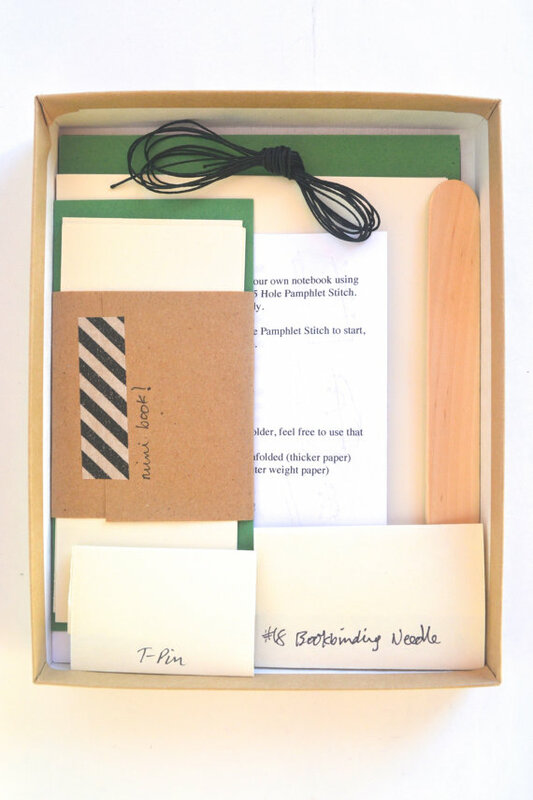 I bought one of their bookbinding kits at the One of a Kind Show this past December and I can’t wait to break it open and give it a go! Now we get to move onto cute and mini! How about a set of 6 mini book magnets? Perfect for your fridge! If not magnets, what about a leather journal pendant? These necklaces are tiny, awesome and completely functional! You can write down your thoughts and dreams and keep them close to you! 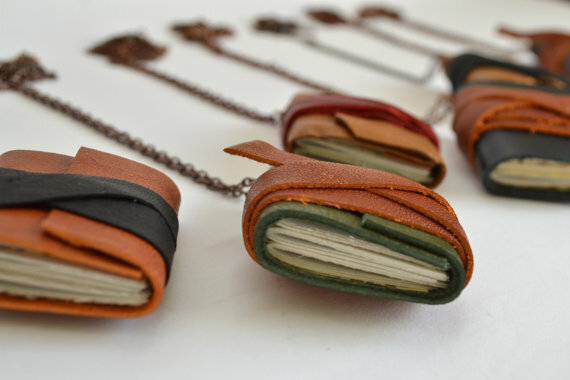 You are as in love with these hand-bound books yet as I am? You can find out more by going to any of the below sites for more information. This weekend is Magfest. If you are a video game fan and don’t know what Magfest is, then you definitely need to check it out. Magfest is a 24 hour video game convention at the National Harbour in Mary;and. There is so much to do they have to keep it going 24 hours. Take a look at the tentative schedule they posted. There is so much to do! Nicole and Toni will be there for their fourth year. Nicole is debuting some new dolls she has been planning just for Magfest as well as some of her traditional dolls, scarves, and yarn goodies. 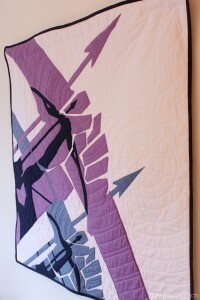 Toni will be debuting panel quilts and character pillows as well as some of her pieced quilts you have come to love. We will both have all sorts of information about Craft Hackers and becoming a member. If you have been considering becoming a member of Craft Hackers, please make sure you stop by and we can answer any question you may have. One of the unique aspects of Magfest is there is no map of the dealer area. The artists and dealers are given their spaces Thursday and Friday. It makes it a little harder for you to find us, but not impossible. The great thing about Magfest is the dealer area is kept pretty small compared to other conventions. If you are still having problems finding us, when our tables are set up and ready to go this afternoon we will send pictures and directions on how to find us on Toni’s Facebook, Toni’s Twitter, and Nicole’s Facebook. Oh and did I mention that our amazing friend Sean will be taking the night shift Friday and Saturday night? That means Craft Hackers will be open 24 hours from 3pm Friday until 9pm on Sunday! If you are so busy and can’t make it to us until 2am, that’s ok, Sean will be there for you! So we hope to see you this weekend. It is one of my favorite conventions and I can’t wait! I am very excited to announce that the official Craft Hacker You Tube channel is launching! I received so many messages from people that wanted more tutorials and videos that we are going to give them to you! Our You Tube channel will feature tutorials, advice, interviews with crafters, and all sorts of crafty goodness. This weekend at Magfest I am going to scout out other crafters and interview them about their process for you. Our official You Tube channel can be found here. If you like it, please subscribe! Today let’s kick it off with a set of three videos. Sprite Stitch member and Etsy store owner Game Crafts put together an awesome tutorial on how you can create a cross stitch pattern using a picture or sprite. This is also the process I use for my quilt patterns. Just imagine one pixel as one quilt block. The first video gets you started by picking your sprite and preparing it for your program. I even learned a few things! The second video helps you with KG Chart and how to import and export your picture. The third video helps you with PC Stitch and how to import and export your picture. If you would like to learn more let me know! I can ask Game Crafts to make another video, or have another artist make a video about a different topic of your choice. Don’t forget to check out Game Crafts Etsy store here where you can find cross stitch patterns and perler bead projects. Rather than jumping off into the new, I thought I’d take the time to tell you about my favorite project from 2014 as we all wistfully bid it goodbye. Like many of the others here at Craft Hackers, I have a love of comics. I’ve always been more of a X-Men or Top Cow fan, but I have been thoroughly enjoying the adaptations of Marvel’s various Avengers. Not nearly as much as a friend of mine, though, who is a huge Hawkeye fan. She happened to have her first child last year and took to calling her bump Hawkeye (which, if you know the comics is highly appropriate as there are actually two Hawkeyes, one male, one female). Needless to say, when it came for me to find something to give the baby, I couldn’t resist making a Hawkeye themed baby quilt. Sadly, Clint Barton is not the most popular of Avengers, and while there were fabric prints out there, finding one with Hawkeye on it proved challenging. Print-it-yourself fabric services like Spoonflower are exceedingly costly for me to access in Europe, so that was a no go. 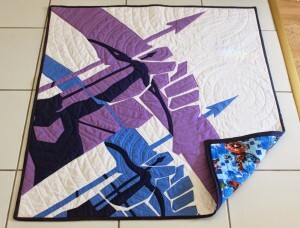 Eventually I found a fabric, but it barely had poor Hawkeye on it! So what did I do? Use it for the backing so no one would ever see the fabric that it took me 2 months source. In the end, I settled on a pattern based off of one of the covers of Matt Fraction’s 2012 Hawkeye reboot, with art done by David Aja, and (because I couldn’t possibly do things by halves) created my biggest, and first, appliqué project. I learned a lot doing this quilt, not just in the terms of appliqué. Quilts I’ve made before this have been relatively traditional in terms of colors and techniques. For the full story of how it got created, you can check it out here. More importantly, though, this taught me the importance of making your work more than “just” a project, but creating Art. Both myself and little Hawkeye’s mother have been surprisingly emotional over it, so much so that it is now hanging on a wall instead of being used in a cot (which is what it was intended for). I’m hoping future projects will continue in this vein- with a little more art and care from me. This was definitely my favorite project from 2014. What was yours? We’d love to see photos of it, no matter what type of craft it was. Leave a comment below or pop over to our forums here at Craft Hackers and show us!